What do you think of when you hear the word turquoise? It might come to mind the American Southwest, where turquoise has been a part of Native American tradition for thousands of years. But turquoise has been mined in many places throughout the world, and clear blue Persian turquoise it thought by many to be among the finest examples of the gem. Mines in India produce green turquoise, and Chinese mines are currently selling a great deal of turquoise in varying colors to the jewelry industry—be aware that much of this turquoise has been dyed or manipulated in another way. Mines in the southwestern US, many family-owned, yield turquoise in a variety of colors and qualities. Turquoise forms when water percolates through rocks that contain copper, aluminum and other minerals. A chemical reaction takes place that results in deposits of what we know as turquoise. That's a simplified way of describing a process that takes millions of years and only happens when a complex set of conditions come together. Why Does Turquoise Exist in Different Colors? The blue in turquoise is enhanced when copper is present. If the area where turquoise is formed contains more aluminum, the turquoise will shade to green. When zinc is present, the deposits are a yellow-green color, a rare combination that so far has been found in only a few areas, including the Carico Lake and Blue Ridge mines in Nevada. Why Does Turquoise Sometimes Have Dark Markings? Dark veining and other marks are the matrices, portions of the rock that 'grew' the turquoise. When stones are cut, some of the matrix remains bound to the turquoise. The amount of matrix present varies and so does its color because turquoise can form in different types of rock. Is Turquoise a Hard Stone? The hardness of turquoise used for jewelry usually varies from 5-6 on the Mohs scale of mineral hardness. The hardest turquoise is usually found nearest the surface of the earth, where it's had a chance to dry—or cure. Softer turquoise is chalk-like—too soft and porous to be used unless it's treated. To create stabilized turquoise, an epoxy resin or other substance is infused into the pores of the stone. It's no longer porous after treatment, and color remains the same over time. Stabilization allows designers to use poorer-quality turquoise that might otherwise not be suitable for jewelry. Most of the turquoise found in today's jewelry has been treated or enhanced in some way, and there's nothing wrong with that as long as you know about the treatments before you buy—and pay a suitable price for the stone. If jewelry designers could only rely on high-quality, natural turquoise, high prices would prohibit many of us from owning the gem. Natural turquoise may have been cut and polished, but no artificial changes have been made to the gems. Color may change over time as body oils and other sources of moisture are absorbed into the stones, creating a lovely patina. 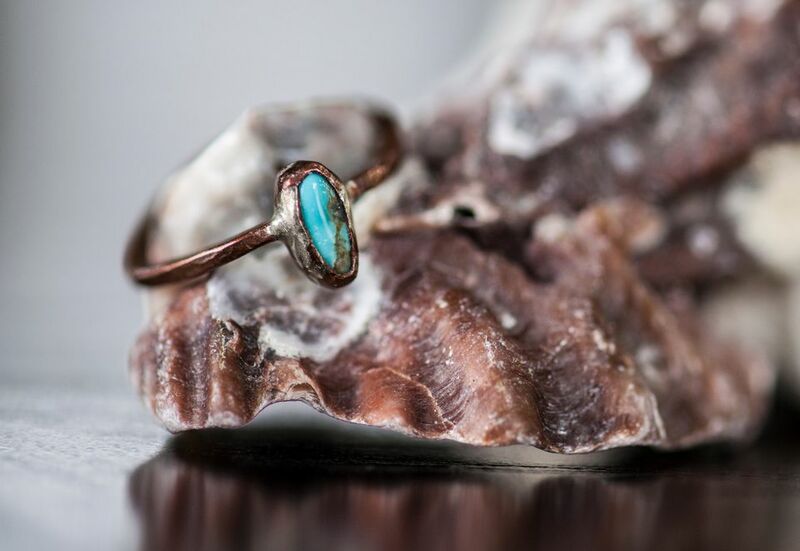 Only high-quality turquoise can be used in its natural state. Handle your turquoise jewelry carefully to avoid scratching the stones. Don't store turquoise jewelry with harder gemstones or other materials that might rub against the turquoise and cause damage. Keep turquoise away from high heat and chemicals such as oils, perfumes, and household cleaners. Even stabilized turquoise can be affected by a constant bombardment of chemicals.